People write autobiographies and memoirs— is Kakiyan author’s story? Fables and satire are literary genres: they feature animals, inanimate objects with human qualities. Kakiyan has a lot of similarities to both; but the uniqueness in Kakiyan is, Capt Elmo, the satirist, adds humour. He combines a portrayal with thoughtful reflection on humans, through the eyes of the most intelligent bird. Reading about the game of poopshooting, my nostalgic memories took me back in time to SSC Prep’s Sinhala Literature class; Mahaoushada’s parrot in Ummagga Jataka’s tale on parrot and Kewattaya, the Chief Minister, who invites the monarch to the royal garden to convey something confidential against Mahoushada. Mahoushada’s pet parrot witnesses the saga and decides to go and rest on a branch above the two and eavesdrop. I quote: ‘…Now the parrot, after it had finished hearing their plot, let a lump of poop fall on the Minister's head, and when he looked up with mouth wide opened to see what it was, the parrot let another lump fall into his mouth.’ Crows cannot use any sporting equipment, so they invented the game. In his conflict free mind, Captain has ample space for innovation. It is free of norms, free from theories, regulations, division of any kind, race, religion, creed or caste; of all the sophisticated types of birds, he selected the crow for his observations. Kakiyan, does not perceive any superiority in man compared to the animal crow; the tales in it are often amusing but philosophical. The crow family uses the term “great ones”, a sarcastic expression to denote us, the human clan. It was only last Monday at the Colombo University, that I had an opportunity to attend a talk on birds by an eminent ornithologist. Like our Captain he once studied the movements of crows in his compound, he observed a crow who came flying with a piece of a food item and dropped it near the edge of water still flying above, for the fish to flocking around the bait. They've learned that if they drop a nut into traffic, cars will run over it and break it open making the task easier. Venerable Sri Rahula Thera and other scholar-poets of the 15th and 16th centuries chose birds with lovely appearance to carry messages in their famous Sandesa Kavya, like selalihini, parrot, pigeon, koel, cookoo, golden oriole and swan. These texts recognise birds’ amazing beauty comparing them to jewels and flowers, but none of these authors ever turned to the crow, because they suffered the basic human weakness; their emotional perception to look for external beauty, that our author attributed little value to. In ‘crow, cheese and fox’ fable, the fox said, “Good-day, Mistress Crow,” he cried. “How well you are looking today: how glossy your feathers; how bright your eyes, your voice must surpass that of other birds; let me hear but one song from you.” As the Crow responds; the piece of cheese drops. Then a word of advice from fox to crow: “In future, do not trust flatterers.” The only Sinhala fiction in which the characters are exclusively portrayed by birds is ‘Wavuluwa’ by Raphael Tennakoon. Written in the 1950s. The reader can gain a good knowledge of the human condition, for smart crow Kakiyan’s antics takes him to law courts, soccer fields and every nook and corner that humans are unable to reach. We have a lot to learn about humans from Kakiyan. In American folklore, the intellect of crows is portrayed as their most important feature. Alfred Hitchcock's 'Birds’, the 1963 American thriller film, focuses on a series of sudden, unexplained violent bird attacks on the people over the course of a few days. The two varieties of birds Hitchcock uses are pigeons and crows. Hitchcock stated in an interview that the birds in the film rise against humans to punish them for taking nature for granted. Kakiyan does the same, but here the author takes a different approach-instead of violent attacks he uses satire, lampoon, exaggeration, and he ridicules, exposes and criticizes the ‘great ones’ our ideas critically in an amusing way. Famous writer Padma Edirisinghe wrote in her biography, “I had three sisters, two of them like me dark in complexion. The only fair girl suffered an incurable illness and died at 18. “Of the mourners who gathered”, she says, “I overheard quite a few of them commenting, “aney…, sudu ekkena ma ne marune” [‘what a misfortune it is the fairer one who died’]. The traditional New Year wish for long life made at oil anointing ceremony --kalu kaputa sudu wenathuru…-- [untill the black crow becomes fairer… and so on], the verse is centuries old-they don’t like black crows either. One needs a lot of strength and character to engage the characteristics of crows, the so-called ‘black and ugly’, to explore and comment on life. Capt Elmo had the nerve and spirit to deviate from established norms and concepts. Edgar Allan Poe wrote ‘Raven and Other Poems’ (1845). There is no consistent distinction between "crows" and "ravens", crows generally being smaller than ravens. MS Fernando, another product of Moratuwa who composed and sang ‘Mang Kolomba kakkek nario colomba kakkek…’ gave a modern interpretation to the fable. The crow from Colombo does not drop the cheese, but held it tightly under his foot and sang. Kakiyan denounces human qualities, Mama Alice warns her children. 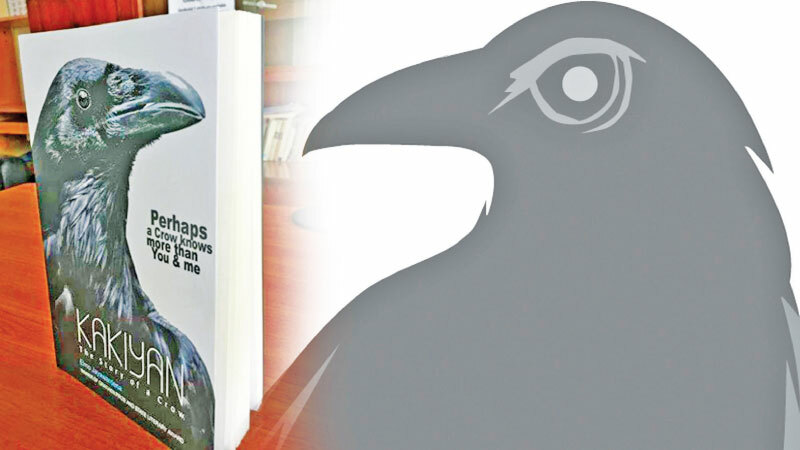 Capt Elmo has taught the world of birdwatchers how to appreciate the beauty in a black crow; a world that listens to melodies of the nightingale…, how to enjoy the jingles in a crow’s cacophony. The book questions conventional wisdom, it challenges authority and marvels at mysteries that struck many as mundane. It is not horrifying, though it mocks people and ideas. Read Kakiyan, you shall never be able to see a crow without a gentle feeling of fondness, and profound respect for the bird.